An enthralling and original idea that has been cleverly crafted into a superbly written book; SAVAGE BLOOD had me glued to the sofa and I finished reading it in a single sitting. After being extremely disappointed by Chance's first book, THE FINAL DAYS, this one has completely changed my opinion of this author and I loved it. Set in a tropical island paradise somewhere near India, the novel does have slight undertones of Jurassic Park, in that a somewhat crazy, but very wealthy, individual has plans to create a 'safari' out of an undiscovered tribe and does not take into account the possibility that they might not like the idea - but don't let that put you off. Around this central theme we have three other stories. First, that of a father, driven insane by the loss of his son, who went as a missionary to the same tribe and is believed to have been killed by them. He refuses to accept this situation and is attempting to prove that his son is still living. The second story concerns Dr Charlie Cortez, who is being driven to distraction by his overbearing wife and makes a single visit to a night-club in order to relieve his tension. In so doing he has a brief encounter with a young lady who will forever change his life and he ends up traveling to the same island to try to discover the truth behind a strange disease that is robbing her of sleep and ends up killing her. Finally, we have Dr Reeta Kapoor, an eminent anthropologist who also ends up traveling to the island. She is trying to find her brother who has gone missing and ends up becoming far more deeply involved than she would like. All the stories are cleverly intertwined and they leave you thinking about the rights and wrongs of the way in which modern society goes about 'rescuing' primitive civilizations - for whatever reason: be it religious, cultural or for selfish financial gain. I simply love this book. It is well written and filled with richly described scenes and interesting characters. SAVAGE BLOOD was a great way to start off my 2011 reviews for Euro Crime. I strongly recommend that you buy a copy and read it for yourself. 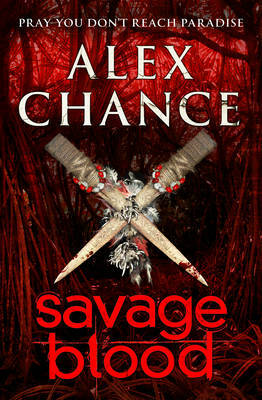 Read another review of SAVAGE BLOOD.